Announcement HomeHearthGarden is the premier Etsy wreath shop for high quality, handcrafted front door wreaths including hydrangea wreaths, boxwood wreaths, and greenery wreaths for all seasons. 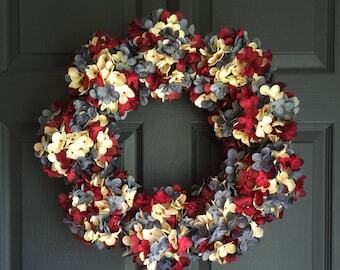 Each door wreath is handmade to order in my Michigan studio using premium artificial flowers with superior quality craftsmanship and backed by excellent customer service. 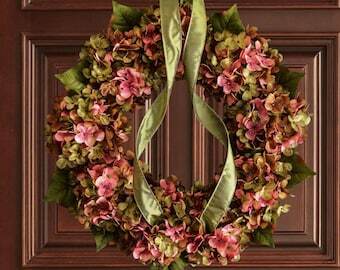 Let me help you create a signature look for your entryway! 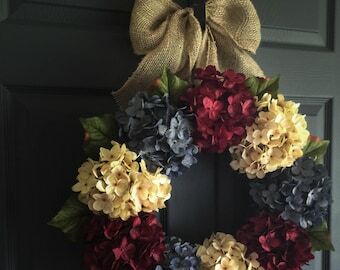 At HomeHearthGarden you will find original wreaths for the front door and hydrangea wreath designs you can use as an Everyday Wreath, Farmhouse Wreath Decor, MOTHERS DAY GIFT WREATH, SPRING WREATH, SUMMER WREATH, FALL WREATH, Patriotic Wreath, and Christmas Holiday Wreath Decor. 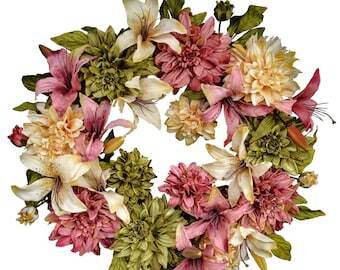 Also, you’ll find a nice selection of Blended Hydrangea Stems to use as accent flowers for your home decor. 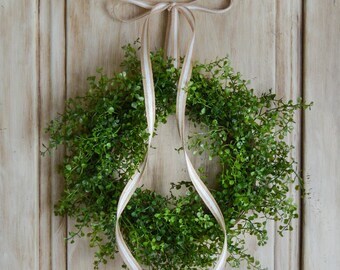 Or, perhaps you would like to choose from my selection of decorative Boxwood Wreaths. 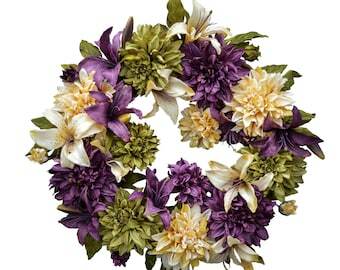 Whichever wreath you select, you will enjoy a stylish wreath design that will last for years to come. 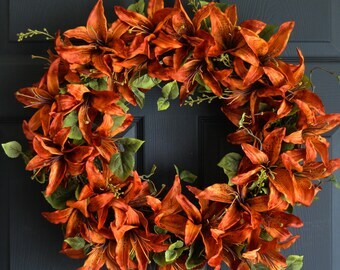 I am amazed and honored, to find HomeHearthGarden Wreaths featured in Paramount Pictures "Instant Family" movie, and by GoodHouseKeeping.com, BHG.com, HGTV.com, HouseBeautiful.com, Balsamhill.com, MyWedding.com, SouthernWreathCharms.com, American Farmhouse Style Magazine, Boom Magazine, and so many other blogs and websites. Since launching HomeHearthGarden in 2013 I have shipped over 9,000 wreaths to the USA, Canada, Europe, Asia, and Australia. 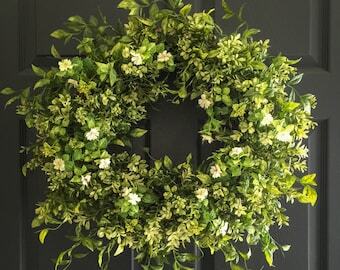 All wreaths are carefully packaged and protected for the journey. I use either FedEx Ground or USPS Priority Mail. 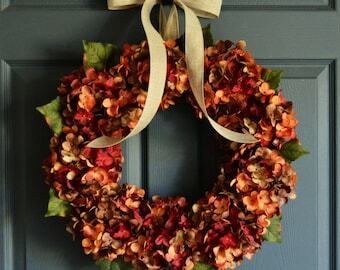 IMPORTANT NOTE: Each wreath is handmade to order. Therefore lead times may vary by demand. Standard lead times are 7 – 10 days. However, during the holiday and seasonal rush lead times can extend to 14 - 21 days before shipment. 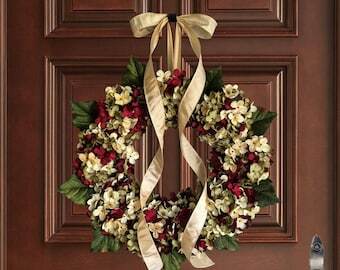 (If you need your wreath by a specific date, just include a message to me when you place your order). © 2019 HHGDecor. All rights reserved. Photos and Designs are for personal use only & may not be resold or published online. 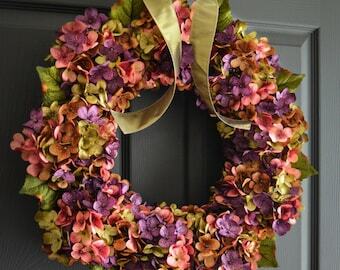 HomeHearthGarden is the premier Etsy wreath shop for high quality, handcrafted front door wreaths including hydrangea wreaths, boxwood wreaths, and greenery wreaths for all seasons. 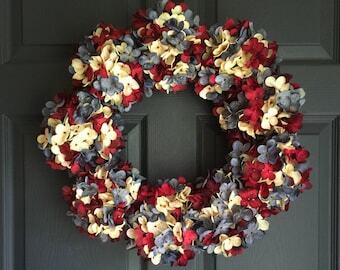 Each door wreath is handmade to order in my Michigan studio using premium artificial flowers with superior quality craftsmanship and backed by excellent customer service. Just in time for Easter. Started not to use the MacKenzie-child’s ribbon that I used for the bow catheter colors are right but didn’t want to cover up any of the beautiful wreath! Totally pleased. I will be a returning customer!!! 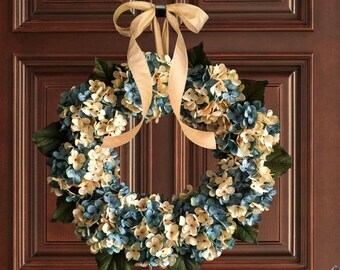 New for 2017 Summer Blended Hydrangea Wreath. Watching the sunset over Lake Michigan in Frankfort. 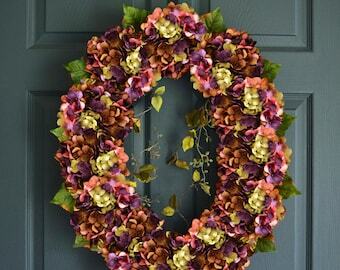 Create a signature look to your entryway! I am not a big believer in straight-lines and square edges. My children (grown now) still get a laugh when they see me arrange a table or re-arrange furniture. I guess it is the creative side of my brain. My husband is the opposite. His engineering brain dictates straight lines and square edges. But he loves our home décor and accents. We raised a family of four starting at a very young age. As you can imagine, or attest to, money is extremely tight starting off. But, I believe in creating a home that is filled with Love, Inspiration, and Encouragement. So, when we started our family, I taught myself several hobby crafts so that I could give my family a home that was decorated with warmth and coziness. I love working with grapevines and flowers (probably because they do not have straight lines). 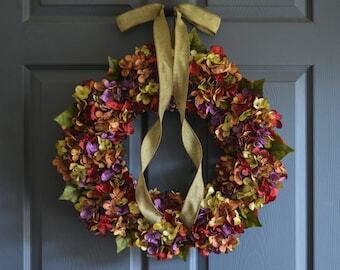 I began making wreaths from a grapevine, spiral trees with grapevine, then added floral to each to provide a flare of the seasonal colors. The ‘hobby’ became a way of expressing myself to those who would come and visit our home. I quickly discovered that there were many more like me that didn’t necessarily liked straight-line décor. At that time, I didn’t realize that I was starting a business, but more and more I was asked to make a grapevine tree, or hydrangea wreath, or Christmas ornament for a family friend, or one of their friends. Over the next 25+ years, the demand kept increasing to the point that my husband encouraged me to step out of the daily grind of work and to devote myself to designing and creating full time. Now, I can work in my studio to create new ideas, and refresh a few past creations that are all centered to provide the sentiments of Love, Inspiration, and Encouragement. I hope you enjoy browsing my shop and if you take away anything….. that you may be inspired. (Perhaps you may be inclined to skew that magazine on the table ever so slightly so that it isn’t in straight-line with the edge of the table). Thank you for coming to Home Hearth Garden – Making Home & Life More Beautiful. Be sure to click the Facebook LIKE button on the front page of the shop.